The Christmas season is the season to shop, and your local merchants are ready for the holidays with great gift ideas and specials aimed to save you money. Shop the downtown communities of Ludington, Pentwater, Scottville, Hart, and Manistee--the stores put you in a festive mood with their colorful decorations and seasonal music. You'll find gifts for everyone on your list...unique items you can't get at the mall. And keeping dollars locally helps your neighbors and the community. It just feels nice to walk down friendly sidewalks and gaze in the store windows as snowflakes fall. What is better than that? In addition to the downtown shopping opportunities, there are numerous Arts & Crafts Shows and Bazaars during the fall where you can find handcrafted and specialty items for your Christmas gift-giving. Here is what usually occurs. Dates for 2019 are being added as they become available. - St. Simon Applefest, 9am-5pm. St. Simon Family Center & Gym. - T.W.I.G. Unique Fall Bazaar Hosted by Spectrum Health Foundations and Spectrum Health Ludington Hospital, 9am-3pm, United Methodist Church of Ludington, 5810 Bryant Road, Ludington. - Manistee Marketplace, 10am-2pm, Manistee United Methodist Church, 387 First St., Manistee. - 5th Annual Arts and Crafts Show, 10am-3pm, Ludington Senior Center, 308 S. Rowe St., Ludington. - Wellston Boosters Craft Show, 9am-3pm, Norman Township Community Hall, Wellston. - VFW Craft Show, 9am-3pm, VFW Post, U.S. 10, Custer. - MCE Athletic Boosters Art & Craft Show, 9am-3pm, Mason County Eastern School, Custer. - ReJoyce Fall Arts & Crafts Show, 9am-3pm, 201 S. Washington Ave., Ludington. - Mistletoe Market, 9am-3pm, Lincoln Hills Golf Club, Ludington. - Holiday Arts & Crafts Show, 9am-3pm, Foster Elementary School, Ludington. - Heritage Bazaar, 10am-2pm, Manistee First Congregational Church. - Multi-Vendor Open House, 10am-2pm, American Legion Post 76, 318 N. James St., Ludington. 16 - Fall Arts and Crafts Show, 10am-3pm, Ludington Area Catholic School. - Annual Deer Widows' Vendor and Craft Show, 9am-3pm, Dunes Express Inn and Suites, Hart. 23 - Christmas Shoppe Arts & Crafts Show, 9am-3pm, Mason County Reformed Church, Scottville. 30 - Ludington Arts Center Holiday Craft Show, 10am-4pm. 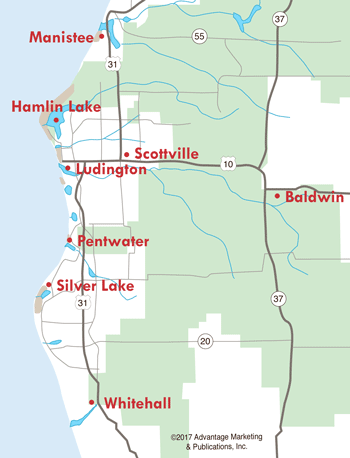 Ludington Area Center for the Arts, 107 S. Harrison St., Ludington. - Manistee VFW Ladies Auxiliary Christmas Bazaar, 10am-3pm, Manistee VFW, 1211 28th St., Manistee. - Market Craft Fair 10am-2pm, St. Vincent's Parish Hall, 637 E. Sixth St., Pentwater. 7 - Craft Fair, Pentwater Public School, Pentwater. - Lakeshore Animal Friends Bazaar, 9am-2pm,Mason County Animal Control, Meyers Road, Ludington. 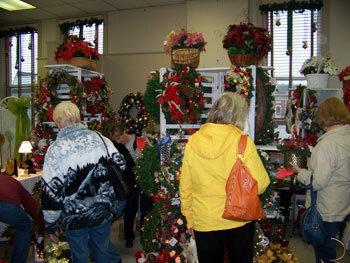 - Manistee Sleighbell Bazaar and Craft Show, 9am-4pm, Manistee High School, 12th St., Manistee. - Scottville UMC Christmas Bazaar, 9am-2pm, Scottville United Methodist Church, State Street.